Unique indented channel on the inside of the centre cone acts as a feel guide and keeps the foot in the perfect position while effortlessly pulling on the compression stocking. Heel Guide™ Compression Stocking Aid...Unique indented channel on the inside of the centre cone acts as a feel guide and keeps the foot in the perfect position while effortlessly pulling on the compression stocking. 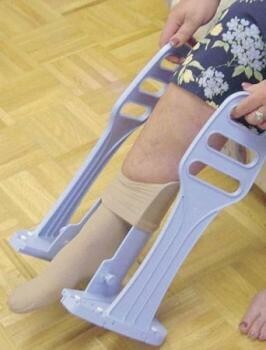 The extra wide cone is ideal for people with oedema or larger feet. High sturdy handles reduce the need for bending or stretching. The handles also feature 3 gripping levels to accommodate different heights and hand sizes. Easy to assemble and can be taken apart for travelling or storage.